When your partner asks you to take a hot spring resort, it is a simple job. If he or she demanded the resort should be easy-access from Tokyo, located in the mountains area for climbing and a lakeside for cruising, in addition, have art museums, what would you do? I would fake sick with my hands on my abdomen, shouting “I have a stomach ache” if I didn’t know the ideal place, Hakone. Miraculously, Hakone hot spring resort offers everything enjoyable including climbing, lake cruising, and numerous art museums. Weather permitting, you have the added advantage of viewing Mt. Fuji. If so, you are very lucky. Japan has more than 3,000 hot spring resorts which have various characteristics, but Hakone boasts the largest number of repeat customers in Japan. And no wonder. It is because an hour and a half train trip takes you to Hakone from Shinjuku Station in Tokyo. Any other hot spring resorts are no match for Hakone in this easy access. copyright 2015 Odakyu Electric Railway Co., Ltd. & Odakyu Hakone Holdings, Inc. all rights reserved. In an age when medical science was not advanced, “hot spring cure” was common and popular. People who had any disease did extended stays at hot spring resorts and tried to cure it. Today, when medical breakthrough has been achieved, this medical custom is not obsolete. Since wide variety of minerals are dissolved in hot spring water, materials contained in a spring have to be labeled accurately when spa facilities give its good effects on health to publicity. For example, at the hot spring of the Image 1, this spring quality is alkalescent pH 8.2 and contains natrium, calcium, magnesium, and so on. By labelling the information, the usefulness of the spring for nerve pains, arthritic, arterial stiffening and others can be demonstrated. While it has good effects on some diseases, the spring can be contradicted for person with severe heart disorder or active tuberculosis. Interestingly, some people have the “qualification of onsen (hot spring) sommelier”. 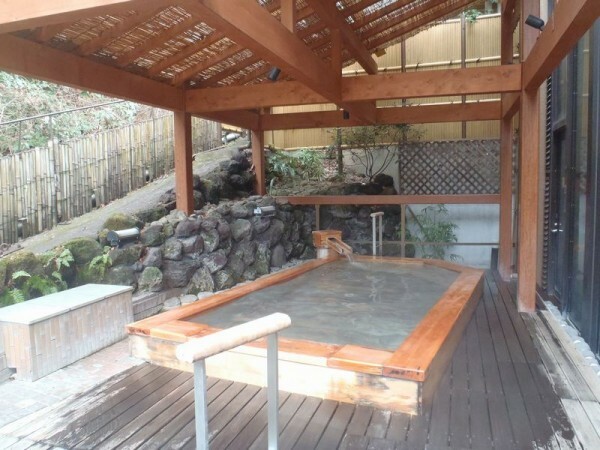 As wine sommeliers have a detailed knowledge of tasting and decanting, onsen sommeliers are familiar with how efficiently hot springs are utilized. The group qualifying as the title emphasizes that you go to hospital when you are sick and you go to onsen when you are well to prevent any disease. Hot spring cure, I think, has a good influence on mental health as well thanks to a diversion that people visit an unknown place and spend relaxing time while soaking a hot spring surrounded by nature. If I do so, my impetus character would be changed into well-poised and generous-hearted! Compared with other hot springs, Hakone area as hot spring resorts is extensive very much. A picture from the sky gives you the whole image of Hakone. In the center, you can see a large basin. This is a caldera (Reference to the article in this site, “Don’t be scared of Japanese Volcanoes”.) in which there are mountains with central cones named “Hakone Mountains”. The highest point is 1,438 (4717-feet). There is a lake to the upper right where you can enjoy cruising. Hakone is located in the very important route connecting Tokyo and Kansai area (Osaka and Kyoto), but this topography made the area hardest bottleneck. Originally, seven hot spring towns existed along the main streets. Enlarge the Image 5, please. A feudal lord procession troops along a steep narrow track. This mountain path was the most exhausting point for travelers since ancient times, but now, Hakone has become a popular resort area. 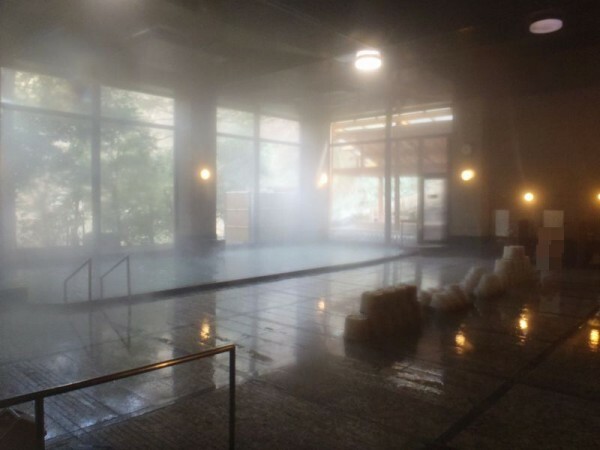 With an increasing popularity as hot spring resort, Hakone now has 17 onsen towns. Each hot spring has distinctive feature and spring quality. If we tried to know every detail on Hakone, how long would it take? Shinjuku terminal (Link to the location) handles as many as over 3 million commuters, which are the largest number of all the stations in Japan. To go to Hakone, it is recommendable to get on a limited express nicknamed “Romancecar” of Odakyu Electric Railway from crowded Shinjuku station. This cool dome car takes you to Hakone-Yumoto station in an hour and half. Here is already one of the 17 hot springs of Hakone. Some go on a day trip only to take hot springs but here is just a starting point to enjoy all of Hakane’s attractions. Enjoy the Nature of Hakone! Another interesting point of Hakone is to enjoy a wide variety of nature while getting on different types of vehicles. A mountain railway, a cable car and a ropeway give you different sceneries rich in diversity from Hakone-Yumoto to Lake Ashi. First, let’s get on Hakone Tozan Railway to Gora station. Trains are vulnerable to heavy slopes, so they cannot climb them in a liner manner. Mountain trains usually adopt switchback railroads and climb a slope obliquely upward. Reaching a point along the way, trains go to a reversely-directed way. It is enjoyable to look down a landscape from the hillside of the mountain above all while getting on the trains. By the way, there is an old famous hotel along the route where Charlie Chaplin and John Lennon stayed. If you are their fans, it is a good choice to take up your lodgings there. When you get off the train at Gora station, a cable car takes you to Sounzan station. The distance is only 1,200-meter (Approx. 4000-feet), but the difference in height is 214-meter (702-feet). Once people said Hakone mountains were most precipitous in Japan. However, climbing up strongly by cable car is very exhilarating. Copyright © Hakone Ropeway Co., Ltd. all rights reserved. Copyright © Hakone Ropeway Co., Ltd.all rights reserved. As of Nov. first in 2015, the part of the way is out of service due to increasing volcanic activities. Please transfer at Souunzan to a ropeway bound for Lake Ashi. In addition to breathtaking beauty of views, it takes a path above the most famous fumarolic field named “Owakudani” in Hakone. Do you feel wonder of nature or get a thrill? It depends on your sensitivity. The gondola paths the extraordinary spectacle and reaches Lake Ashi while your viewing Mt. Fuji. No place offers various hot springs and as much as natural beauty more than Hakone. Mt. Fuji, lake, and a pirate ship! This lake at 732-meter (2401-feet) elevation is the wonder that nature gifts. In the remote past, a volcano eruption caused the collapse of mountains whose landslide stemmed a river and created this lake. For those who like fishing, here is famous for bass fishing. Every year a fishing competition is held and a fisherman who catch the largest fish by type is bestowed on the champion. The most attractive feature is pirate ships for cruising. How about getting a good feeling as if you were transformed into a Johnny Depp of Pirates of the Caribbean? I have already mentioned this area is easy access from Tokyo and has many tourists. Taking this advantage, only in Hakone area, there are 16 museums small and large. Although I would like introduce all, only three interesting museums are to be covered. The first I recommend is Hakone Open-Air Museum where various sculptures are exhibited outside against a backdrop of nature. Of course, it has many pavilions. For example one specializes in Picasso, and another exhibits the works of Giacometti, Rosso, and Brâncuși. I have never seen such a perfect art museum. It has restaurants and souvenir shops, fully satiating art lovers. This art museum is operated by the cosmetic maker POLA Inc. The feature is the works of Monet, Renoir, and Léonard Foujita. A nature trail whose total distance is 670m (Approx. 2200-feet) in the forests is created. It is wonderful that singing birds and appearing animals have you forget everything of your ordinary life. This museum collects traditional Japanese-style armors, helmets, swords, spears, bows and arrows. In addition, the utensils used in a tea ceremony and ukiyo-e are also exhibited. Here, makeover plan of wearing samurai costume is available. How about transforming yourself into samurai? In the prehistoric age, about two hundred thousand years ago, this peninsula was an independent volcanic island. An earth’s plate moved the island which gradually collided with a mainland of Japan. The frictional heat melted down the crust which formed magma reservoirs. The magma repeatedly erupted, which created mountains of Hakone caldera structure in the upper right and Mt. Fuji in the upper left. Hakone hot springs and beautiful nature is the gift of crustal movements over the eons.